Bill Clinton and Hillary Rodham Clinton later announced in a statement that their daughter wed investment banker Marc Mezvinsky at a Beaux Arts riverside estate called Astor Courts. “Today, we watched with great pride and overwhelming emotion as Chelsea and Marc wed in a beautiful ceremony at Astor Courts, surrounded by family and their close friends,” the Clintons said. Clinton is Methodist and Mezvinsky is Jewish, was led by Rabbi James Ponet and the Rev. William Shillady, the family said. The groom wore a tallit, or prayer sawl, and a yarmulke. The bride wore a dress designed by Vera Wang, the family said. The strapless dress had a swirling silk organza ball skirt and train, and was accented by an embellished belt. It is estimated that 400 to 500 guests gathered at the historic estate. 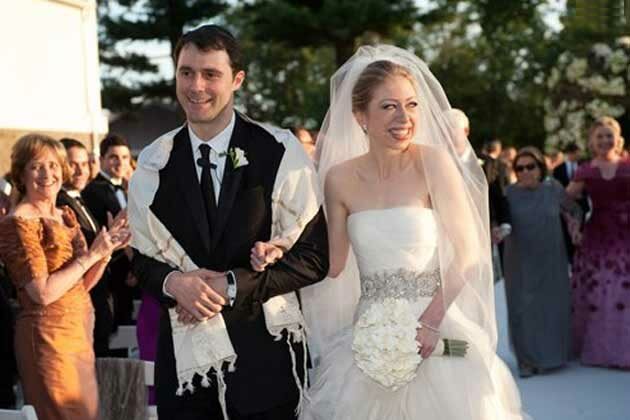 The ceremony was conducted by a rabbi and a reverend as Chelsea Clinton is Methodist and Mezvinsky is Jewish, according to the family. The road to Astor Courts was blocked off Saturday and the sky above was declared a no-fly zone by federal aviation officials. Police and security guards fanned out around this usually sleepy town. It is estimated that the security alone would have cost the Clinton’s $200,000 because of all the high-level politicians and global celebrities. The family had released no details of the wedding but the event became obvious when more than a half-dozen busloads of wedding guests, men in black tie, women in dresses, were transported from a hotel in the village to the riverside ceremony as the amazed residents of the town looked on. Celebrities spotted in Rhinebeck for the event included actors Ted Danson and Mary Steenburgen, fashion designer Vera Wang, Madeleine Albright, who was secretary of state during Bill Clinton’s second term as president and Terry McAuliffe, former Democratic National Committee chairman. Actors Ted Danson and Mary Steenburgen — longtime married friends of the Clinton family — told CNN that despite the public spectacle of the wedding, “it’s been a very personal experience for them. Chelsea Clinton and Mezvinsky were friends as teenagers in Washington, and both attended Stanford University. They now live in New York, where Mezvinsky works at G3 Capital, a Manhattan hedge fund. Mezvinsky is a son of former US Reps Marjorie Margolies-Mezvinsky of Pennsylvania and Ed Mezvinsky of Iowa, longtime friends of the Clintons. His parents are divorced. The only notable absentee at the ceremony was U.S. President Barrack Obama (and family) who had earlier said that he had not been invited and jocularly added that “two presidents at one place would cause lot of security problems”. This entry was posted on Sunday, August 1st, 2010 at 2:00 pm	and is filed under Life, News. You can follow any responses to this entry through the RSS 2.0 feed. You can leave a response, or trackback from your own site.